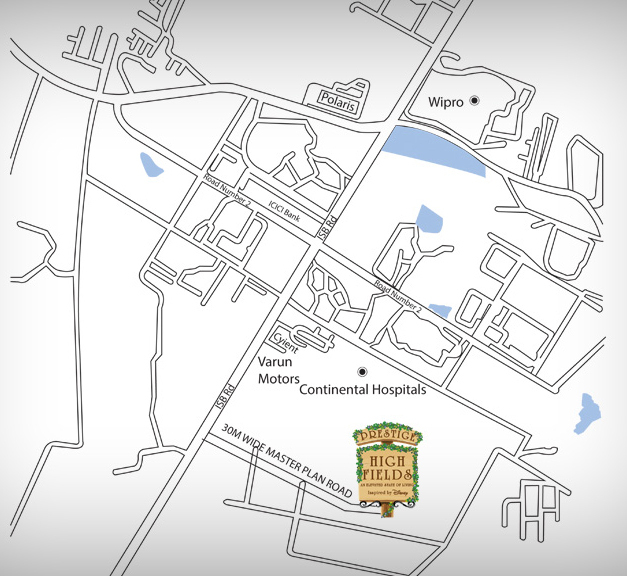 Prestige High Fields: Enjoy the real joys of living here! Ever dreamed in a place where the air is clean enough to breathe without the fear of getting respiratory problems nowadays? A place where the climate is mild and temperate during all seasons? All the facilities and MNC’s nearby so that long commutes and getting stuck in traffic jams is a thing of the past? Well, you just found your dream home in Prestige High Fields Hyderabad. 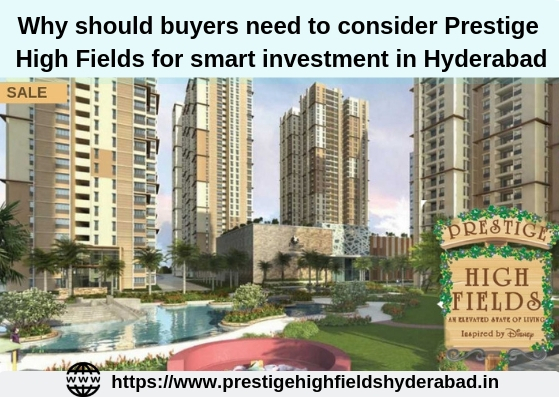 Located in the heart of the Puppalaguda, the financial district Gachibowli of Hyderabad, Prestige High Fields is 21.85 acres of the residential project which is being developed at a prominent location. There are 10 towers of varying levels of floors with 2240 residences. Some towers are 34 floors high while others are only 32 and 28 levels tall. There are 2 BHK, 2.5 BHK, 3 BHK, 3.5 BHK and 4 BHK apartments available here. The area of the apartments is between 1283 sq. ft. to 4070 sq. ft. Many variations of area and design are available to fit everyone’s needs. All the towers are mix-n-match of various apartments! The famed RSP Group is the architect of this project. 20% of the Prestige High Fields Price which is starting from Rs. 73.13* lakhs for a 2 BHK apartment (1283 sq. ft. size), has been set as the booking amount for apartments here. One parking space is being provided for 2 BHK and 3 BHK (up to 1742 sq. ft.) and two parking spaces are provided for 3.5 and 4 BHK residences. Additional parking requests will be taken into consideration upon completion which is Aug 2020. It has amenities par none. There are usual amenities of a gym, basketball court, swimming pool, and many more along with a clubhouse which sprawls over an impressive 1,19,000 sq. ft. ATM, pharmacy, restaurant, crèche, library, salon and other facilities are being established within the premises. The development is a mere 1 km from the Outer Ring Road and 1.3 km from the famous ICICI building! With so much at your feet to enjoy, Prestige High Fields Gachibowli is the place to be! The establishment was conceived in 1986 and since then it has completed and delivered over 210 projects across cities such as Hyderabad, Kochi, Mysore, Chennai, Mangalore and Goa. The patrons of the company have only good things to say about the Prestige Group. The developers have worked across a diverse portfolio covering commercial, retail, hospitality, residential, and leisure segments of real estate. They have developed large townships, hotels, luxury villas, tech parks, SEZs, malls, and so much more. They believe in innovation and endeavour to utilise only the latest in technology for the development and construction of their projects. Over time they have diversified into a number of related and non-related services such as interior designing, men’s formal dressing, and more. They are the only CRISIL DA1 rated Developer in India. The developers have earned several accolades for their quality projects including, “Admired Brand of Asia” and “Admired Leader of Asia 2014-15“. Gachibowli is a major IT suburban area of Hyderabad. The number of working professionals employed in the neighbouring IT hubs of Hyderabad i.e. Hitech City and Gachibowli have escalated and the erupting real estate demands shall positively affect the region in future. With the growth in the number of offices of leading corporates increasing in and around the region, the demand for residential units has shown unprecedented growth. Gachibowli is home to the offices of IT giants such as Microsoft, TCS, Polaris, Accenture, Wipro and Infosys. It also incorporates international banking institutions such as Bank of America, Union Bank of Switzerland and Franklin Templeton Investments. Along with the great career opportunities the region is highly appreciated for its rapidly developing social infrastructure and excellent transport facilities. Jawaharlal Nehru Outer Ring Road connects the region with Rajiv Gandhi International Airport. The region is also in proximity to the Old Airport of Hyderabad. The city of Hyderabad is served by an efficient rapid transit system called Mana Metro. 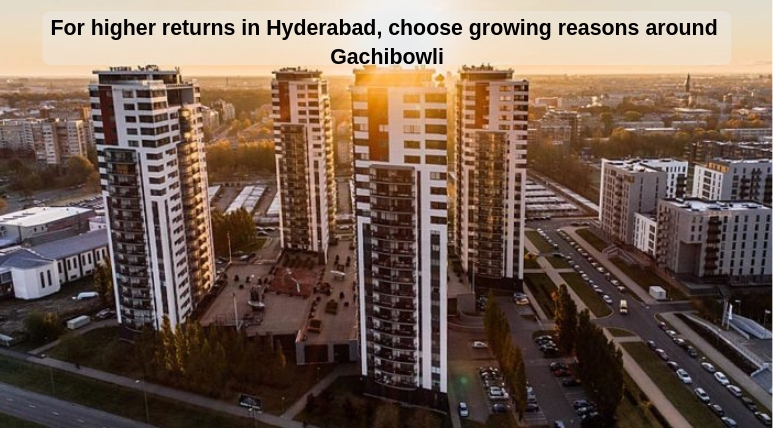 Gachibowli shares its vicinity with Ameerpet Metro station that further escalates the connectivity of the region. Home to the best stadiums and sports complex of the city, this region has been hosting international activities in various sports. The prosperous infrastructure residing in the region constitute of widely recognised schools, hospitals, hotels, malls, banks, ATMs, and more. Prominent hospitals located in the region are Maxcure, Continental andHimagiri hospitals. The real-estate industry of the region is thriving and numerous realty giants have launched projects in this region. It has shown double-digit growth over the past few years and is likely to obtain profitable returns in the coming time. Located at Puppalaguda, Financial Dist, Gachibowli, Hyderabad.